MLSS will be held in the Matrix at Biopolis. Exit left at Exit 8 North Buona Vista/NUH. Keep to right lanes and turn right at traffic light. Drive straight towards North Buona Vista Road. Pass 4 traffic lights; turn right into North Buona Vista Drive. Exit left at Exit 8 North Buona Vista/NUH. Keep to left lanes and turn left at traffic light. Drive straight towards North Buona Vista Road. Pass 3 traffic lights; turn right into North Buona Vista Drive. Board the East-West line and alight at Buona Vista MRT station. 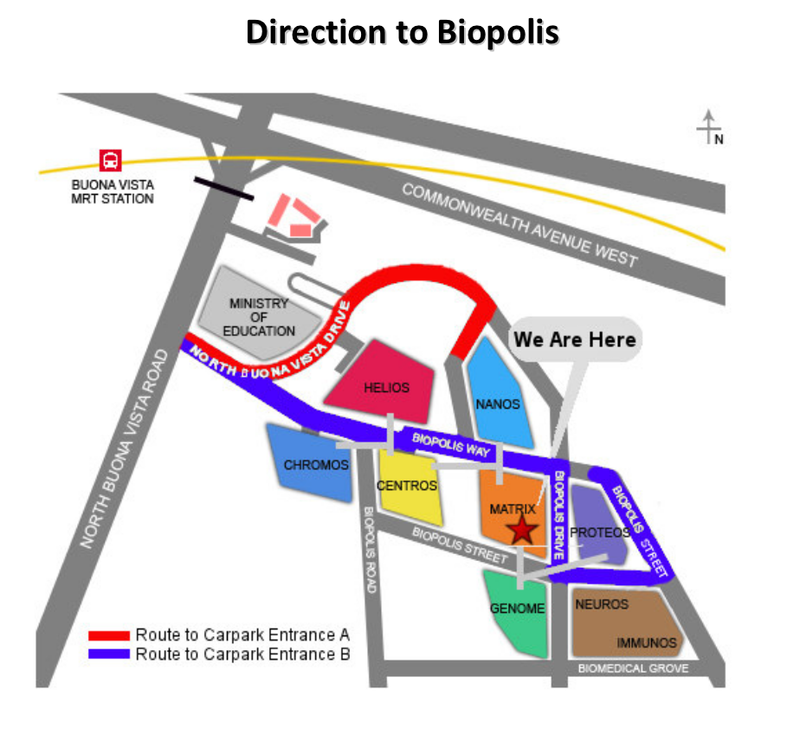 Biopolis free shuttle bus service can be taken at the bus stop in front of Ministry of Education building (see map above). It would take about 10-15 minutes to walk from Buona Vista MRT station to Matrix building. Bus services along North Buona Vista Road are: 91, 92, 95, 74, 191, 196, 198 and 200. More information can be obtained at SBS Transit. Vistors' parking is at B3 only (Cash Card Parking). Any unauthorized parking in B2 will result in the vehicle being wheel-clampled. Park in the Orange Zone for Matrix building and take Lift D to level 1 lobby. # Biopolis pick-up points refer to front lobbies of: Chromos, Proteos, Genome and Nanos.